It’s been a wonderful weekend of dog training! 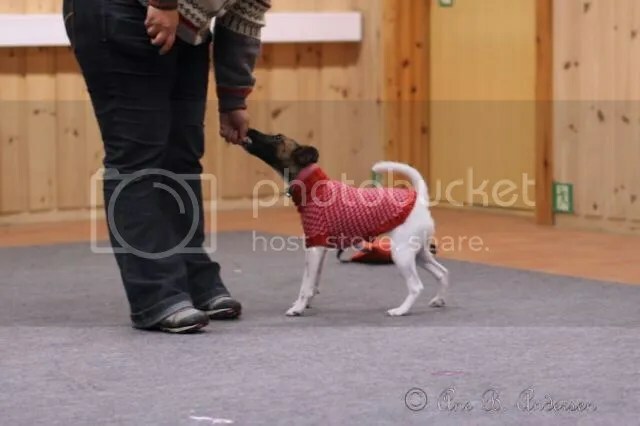 It was the second weekend of the “year long” (= four weekends a few months apart) dog trainer-class and Pipette was a star! I was lucky and sweet Ann Kristin with Mimmi (pomeranian) took a few photos of Pipette in action. She played really well on Saturday, despite lots of people and action. She was a bit more easily distracted on Sunday, probably because I had better treats on Sunday. I only used dry kibble on Saturday which was my bag of back-up treats. But since I left the proper treats that was what we had to work with and she was perfectly happy with it. 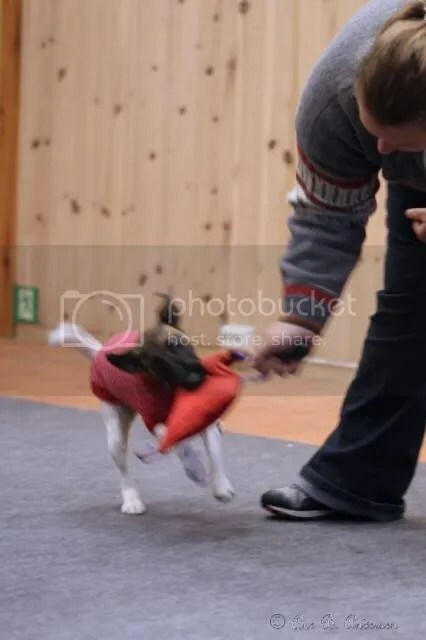 She had a couple of rounds on Saturday trying to get some of the fun people to play and cuddle with her. Unfortunately they were all broken and just ignored her. How rude! (VERY useful training for a social little doggie.) She had a GREAT hand target session and a good heeling- and (jumping) stand session, too. Sunday she was more easily distracted. She’d rather have treats than the toy and I spent a large amount of time running around and tossing the toys until she’d finally show interest in it. It would have been better to do training that didn’t require treats so she didn’t have them at all, probably, but OTOH this bit of “don’t wanna don’t hafta” might be useful to work through, too. 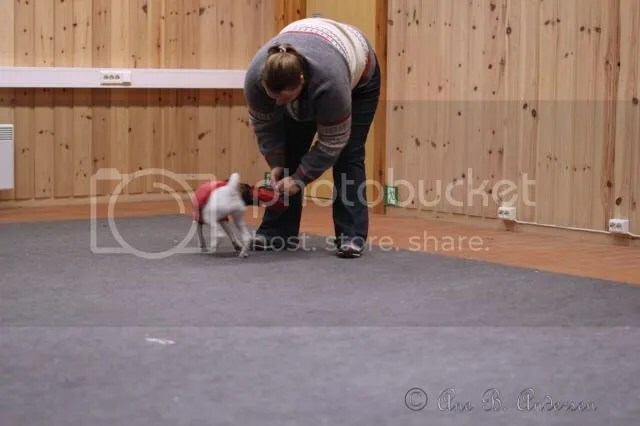 We did eventually move into a different room (one of the other dogs were really noisy) with only a couple of crated dogs and a few people watching and that eliminated the DWDH. 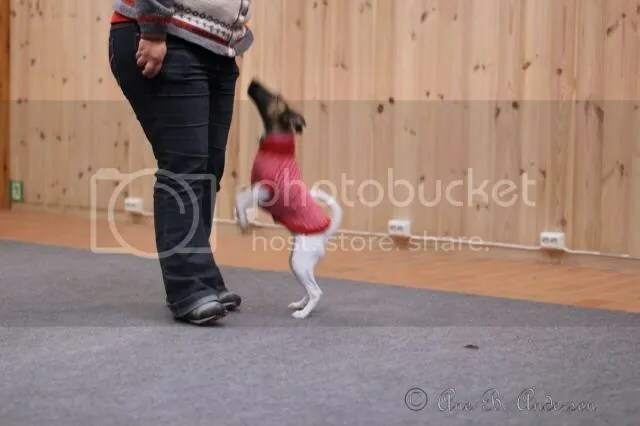 I think all the people and dogs training (we were 4 dogs at a time in the main room and 8 handlers + two instructors) PLUS really yummy chicken and meatballs at the same time was too much for her to make the good choice and stick with me. Sunday we worked on “flow”. Having a fluent behavior means it’s automated and the dog hardly has to think to perform it. 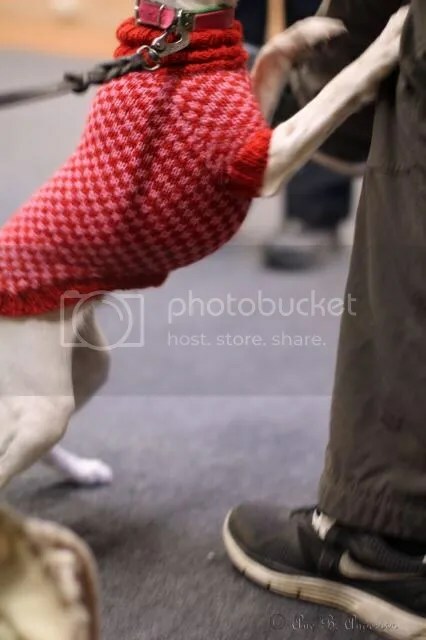 Basically you do lots of repetitions (we worked on sit) until you have virtually no time between eating the treat for a well performed repetition and doing it again. Sit – click – chew -sit and so on. Then stupid me wanted to change to a different behavior once she was fluent with sit. Instead she chose to demonstrate one of the benefits of a fluent behavior – it’s very resilient towards extinction. So she just sat, and sat, and sat some more. She tried sit/stay and she tried multiple sits, but she didn’t ever lie down like I was hoping she’d do. I should probably have decided to click for “anything not sitting down” but by the time I realized just how much time it would take before she came up with anything other than the sit… well… Let’s just say I’ll do it a bit differently next time, but I was really happy with her intensity and willingness to keep working even when sitting didn’t work “the way it was supposed to”. Then we worked on doggie zen and she was almost TOO good. I haven’t used this kind of training with a bowl before, just treats or toys on the ground and she wouldn’t take a treat/toy on my que if it was in a bowl. Just shows you how important it is to vary how you do stuff. So we worked mostly on getting a reliable release to a reward in a bowl. We made a lot of progress, but need to keep working on this. Having a bowl can help with visibility at a distance (help the dog to find the treat or toy in the grass or whatever) so it’s useful to spend some time on this. 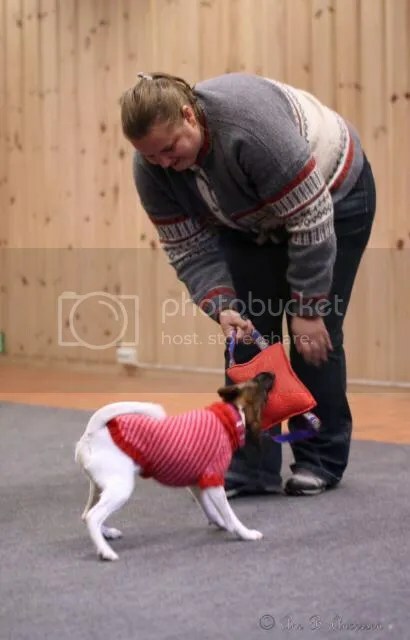 This entry was posted in clicker training, friends, obedience, Pipette by The WriggleButts | Rumpevrikkerforeningen. Bookmark the permalink.